International Boxing Organization (IBO) Superflyweight Champion Edrin "The Sting" Dapudong of M'lang, North Cotabato will defend his title against South African challenger Lwandile Sithaya in East London, South Africa July 6. It will be the 28-year-old Dapudong's first defense of the title he won in June last year by 1st round knockout of South African champion Gideon Buthelezi in Johannesburg. The title defense which has already been sanctioned by the IBO, comes after two botched title defense promotions, first by the Golden Gloves Promotions of South Africa which canceled a November schedule and then later by a group led by Sugar Shane Mosley, British Promoter Dennis Hobson, Fil-Am businesswoman Germaine Giles and lawyer Sydney Hall whose plan to stage a fund-raising boxing event May 25 for Typhoon Yolanda victims did not push through. The fight against the 27-year-old Sithaya, a flyweight who is moving up to the superflyweight division, effectively saves Dapudong's boxing title from being stripped by the IBO. IBO President Ed Levine earlier agreed to extend Dapudong's title defense period to May because of the planned Mosley fund-raiser and recently allowed the Filipino champion to keep his title for the July 6 title defense after it was arranged by South African promoter Alyanda Matiti. The July 6 title defense against Sithaya will be staged in the Orient Palace in East London, South Africa. This will be Dapudong's third trip to the country at the tip of the African continent which could be reached after almost a day of travel from Davao City. In his first trip in 2013, Dapudong fought former Olympian and 2-time world champion Buthelezi for the vacant IBO superflyweight title dominating the fight and knocking down the South African in the 9th round only to lose by split decision. In a rematch June 15 last year ordered by the IBO, Dapudong knocked out Buthelezi in the first round to win the title. With his feat, Dapudong, a product of a grassroots boxing program I started when I was Governor of North Cotabato, earned the distinction of being the first boxer from the province to win a world title. While the IBO is still not as popular as the WBC, WBA, WBO or IBF, it gaining huge following with several big names owning IBO belts. Filipino boxing icon Manny Pacquiao won the IBO jr. welterweight title when he knocked out Briton Ricky Hatton, Ukrainian heavyweight champion Vladimir Klitscho holds an IBO title while one of the hottest names now in boxing Genady Golovkin of Kazakstan also holds an IBO title. Another Filipino, Rey Loreto of Davao City, also holds the IBO junior flyweight title when he knocked out former champion Nkosinathi Joyi in Monte Carlo earlier this year. 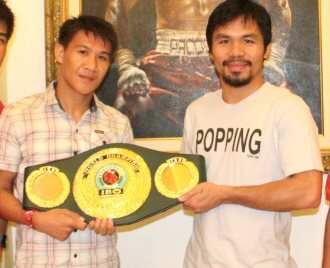 Photo: IBO champion Edrid Dapudong (L) poses with Manny Pacquiao. Click here to view a list of other articles written by Manny Piñol.